Ceylon, an island in the Indian Ocean, located to the south of the Indian subcontinent, became independent in 1948, at the same time with India and Pakistan: like in these two countries the population of Sri Lanka consists of several nationalities, which clashed in conflicts of different intensity time and again. Ceylon, renamed Sri Lanka in the 1960s, is 445km long and 225km wide. It encompasses beautiful tropical beaches, verdant vegetation, ancient monuments and exotic wildlife. The relief features consist of mountainous mass south of the island’s centre, surrounded by broad plains and palm-fringed beaches. The population of Sri Lanka is around 18.5 million, the majority of which are Sinhalese (approx 75%), with large minorities of ethnic Tamils (approx 13%), and some Indian Tamils (roughly 6%). Buddhists constitute the majority (some 70%), while other religious groups are Hindus (15.5%), Muslims (7.6%), and Christians (7.5%). The economy is mainly based on agriculture, with rice being the chief crop, production of which makes the country self-sufficient. Tea, rubber and coconut are also important, with tea being the major foreign exchange earner. Recently, the tourism emerged as important industry as well. At least in theory, Sri Lanka has all the attributes required for a prosperous country: in practice, the country is embroiled in terrible inter-ethnic wars since more than 30 years, which is badly damaging and exhausting not only the economy but also Sri Lankan human resources. The first larger crisis on Sri Lanka was the Sinchalese uprising that broke out in 1971. By the time the militant Sinhalese coalesced around the “Janatha Vimukti Peramuna” (People’s Liberation Front” – JVP), an organisation that propagated the “National Ethos” or “Racial Ideology” along the lines of Cambodian Pol Pot and the xenophobic Burmese generals. The JVP sought to destroy all non-Sinhalese culture on Sri Lanka, including that of local minorities, but also Western technology, architecture and religion. In early 1971 the JVP-activists launched an open insurrection that focused on killing “Westernized” Sri Lankans – foremost politicians and police officers, but also anybody else who disagreed with their racial ideology. On 5 April JVP-rioters attacked the police station at Wellawaya, and by the end of the next day 50 other government installations came under attacks. At the time the riots broke out, the Royal Ceylon Air Force (RCAF) was a small service. It was equipped with few Bell 206 Jet Ranger helicopters (operated by the No.4 Sqn), several Jet Provost T.Mk.51 strikers (all of which were mothballed) as well as Dove and Heron light transports (flown by the No.3 and No.2 Sqn, respectively), scattered around the island, and mainly busy transporting tourists. 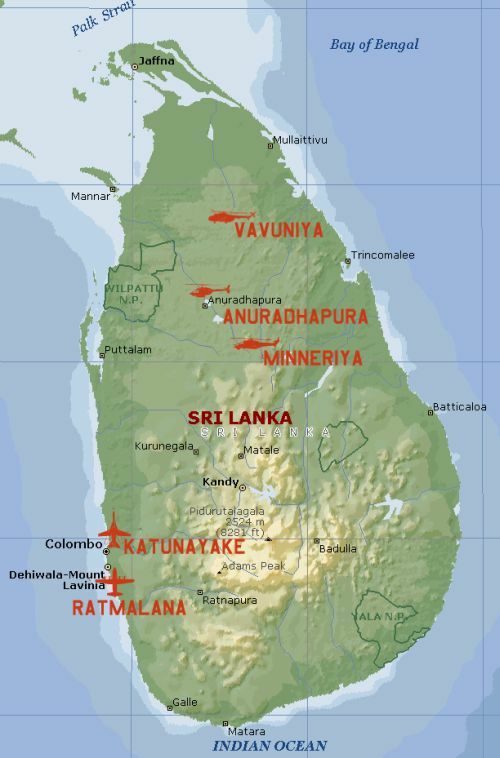 In the following days, the RCAF was first concentrated at the Katunayake AB, and then mainly used to fly support missions for dispersed police and army units north and east of Colombo. Although the security services were swift to put down the riots and regain control in most parts of the country within the next few days, the emergency was meanwhile considered serious enough to reinforce the RCAF, and on 9 April few qualified pilots and re-activated Jet Provosts were organized into the No.6 Sqn. Contrary to the Indian and Pakistani air forces, the RCAF was created without the help of equipment left behind by the British only, but was actually organized and initially run by the British. By 1971, this small air arm had enough pilots, but not enough aircraft and helicopters. Especially the lack of helicopters became very apparent, as they were needed badly to support the troops on the ground. However, the help was already on the way: on 12 April the PAF deployed two Alouette IIIs, while the Indians then sent six of IAF Alouette IIIs to Ceylon. Finally, on 14 April the British purchased six Bell 47Gs in the USA. Upon arrival in Ceylon, these helicopters were used to form the 5 Sqn. By 22 April, also an Antonov An-22 arrived from the USSR, delivering the first five MiG-17Fs, one MiG-15UTI, and two Ka-26 helicopters, which entered service with the 6th and 2nd Sqn, respectively, but were flown by several Soviet and Indian pilots. All these aircraft were used for fighting down the Sinhalese uprising by early May 1971. At a cost of between 10.000 and 20.000 JVP-activists and sympathisers killed, the Sri Lankan authorities managed to force the radicals into underground. Nevertheless, the government did not even manage to declare an end of this emergency when a new problem appeared. The ethnic Tamils on Sri Lanka constitute a distinct nation, called “Tamil Elam”, with a separate social entity, their own history, traditions, culture and language. The problems between them and the Sinhalese were developing through the 1960s, and actually culminated during the uprising in 1971 for the first time. The Tamil politics had its own racist terrorists, which in 1972 created their first organized movement, the Tamil United Front. The TUF was initially executing grenade attacks on civilian officials – usually older Tamils who disagreed with their ideas. The fighting within caused a split between different Tamil Organizations and resulted in creation of “Tamil New Tigers”, the “Tamil Eelam Liberation Organization” (TELO), and – subsequently – the “Liberation Tigers of Tamil Eelam” (LTTE). The LTTE was especially successful in attracting support from sympathetic Indian military officers and agents of “Research and Analysis Wing” of the Indian Secret Service (“RAW”), interested in eventual incorporation of Sri Lanka into India. Consequently, many LTTE-activists received military training in camps of the Indian Federal State of Tamil Nadu. By May 1972, when the new Republic Sri Lanka was declared, the Tamils already had their first armed groups operating: mainly equipped with speed boats, they were executing raids on Sri Lanka or delivering weapons over the Palk Strait to the Jaffna Peninsula, proving more than a match for Sri Lankan patrol crafts solely due to their high speed. Armed, the Tamil militants then began committing atrocities against the Sinhalese civilian population. By 1976 most of the radical Tamil militants joined the meanwhile powerful LTTE. By using all possible overt and illegal methods to raise funds, acquire weapons and publicize their cause – the establishment of an independent Tamil state – they were now conducting an insurgency against the Sinhalese and the government in Colombo. Right from the start the LTTE-attacks against government facilities were extremely brutal and very bloody. Consequently, the LTTE was soon forbidden, but this decision came too late. On 7 September 1978 a group of LTTE fighters penetrated the defence perimeter of the Katunayake airfield and destroyed a SLAF Hawker-Siddeley (later British Aerospace) HS.748 transport meanwhile delivered to what was now the Sri Lankan Air Force (SLAF). LTTE integrated a battlefield insurgent strategy with a terrorist program against key government and military personnel, the economy and civilian structures: while engaging the Sri Lankan security services in fighting, it was deploying its “Black Tiger” squadrons in suicide bombings – especially in political assassinations. By 1983 the LTTE-insurgency spread so much that a state of emergency was declared, as the country found itself in a situation that was to become – more or less – characteristic for the next 25 years of the war. The central government was never to find a proper solution for the conflict with Tamils, the Sri Lankan Army (SLA) was to fight the Tamils at heavy losses for both sides, while the LTTE was to deliver one bloody blow after the other and become notorious for its ultimately brutal methods even between the ethnic Tamils. The permanent attacks culminated in 1985, when in a horrendous LTTE-attack against a Buddhist shrine in Anuradhapura some 150 Sinhalese were massacred and the sacred Bo tree – sprung from a seed of the tree under which Buddha reached “nirvana” – severely damaged. Although the fighting was permanently growing in intensity, it was not before 1977 that the government of Junius Jayewardene recognized the LTTE-threat as serious. There followed an attempt to reform the discriminatory legislation and lessen tensions between the Sinhalese and the Tamils. However, misled by the apparent success of 1971 and wrong advices of foreign – foremost British, Israeli and Pakistani - instructors, Jayewardene left the conflict with LTTE to be handled by the military, while concentrating on massive economic problems instead. The SLA and the SLAF found themselves poorly equipped and trained to fight a counter-insurgency war against the LTTE, which was in possession of arms and training, and had a well-established supply-line to India. By the late 1970s the SLAF was again a very small service which lacked combat aircraft and had extensive problems with maintenance, as the West would not deliver new fighters, while the Soviets conditioned their cooperation on different own demands. The available small fleet of Jet Ranger and Bell helicopters was not enough to support the army, while the combat capabilities of the LTTE were constantly increasing due to intensive support from Tamils living in India, mainly delivered over the sea. The SLAF Jet Rangers, armed with machine-guns, flew constant patrols along the western and northern Sri Lankan coast, foremost around the port of Jaffna. In several engagements with arms-smuggling ships their machine-guns proved insufficient for the task. Besides, such light helicopters were also vulnerable even to small-arms fire. Therefore, the government contracted several Israeli advisors to help it reorganize the army and air force. These failed in their task: on the contrary, the SLA and the SLAF suffered a series of humiliating defeats on the hands of the LTTE, and eventually found themselves without any other ideas but to indiscriminately terrorise Tamil civilians. Of course, this undermined government’s efforts to negotiate reconciliation and supplied the Tamil extremists with additional recruits. Eventually, the Israeli instructors concluded that the SLAF was in a bad need of reinforcements and an increase in air power capabilities. In reaction, a comprehensive modernization program was introduced in the early 1980s, when six SF.260TPs were purchased in Italy, as well as 20 Bell 206 and six Bell 212 in the USA (albeit, the deal was organized via Singapore), and the main SLAF base moved from Katunayake to Ratmalana, south of Colombo. A number of Israeli, Pakistani, and British pilots and technicians were contracted to work with the air force, and also fly some of the Bell 212 helicopters. Nevertheless, even the new helicopters and light aircraft were not sufficient to fight the ever improving LTTE, and it is actually surprising that the first SLAF loss in this war occurred only on 18 May 1984, when a Bell 212 helicopter crashed near Batticaloa, probably due to a sabotage. The first combat loss was a Bell 206 shot down during fierce fighting with the Tamils near Jaffna, sometimes in 1985. One of the main reasons for the success and survival of the LTTE was constant support it was getting from Tamils living in India. The supplies for Tamils were not only transported per ship, but also by aircraft: the Indian Tamils operated several smaller transport planes, which were used to drop arms and ammunition in the Jaffna area. Time and again the Sri Lankan government requested New Delhi to do something against the growing flow of supplies for the Tamil Tigers, but the Indians would not do anything, especially as their politicians were not keen to see Hindu Tamils being defeated by the Sri Lankan Army. Finally, Colombo felt compelled to ask Pakistan for help and the all-out offensive on Jaffna was successful. This, of course, was something the Indians could not ignore: immediately, New Delhi started a diplomatic offensive, exercising pressure upon the Sri Lankans to stop Army operations around Jaffna. When these efforts proved futile, the Indian armed forces were readied for an intervention. Already on 4 June 1987, after the Sri Lankan Navy turned away a “fleet” of boats and small ships that was carrying supplies to Jaffna, several IAF An-32 transports – escorted by Mirage 2000Hs of the No.7 Sqn – dropped food for Tamils in besieged city. Simultaneously, India issued an ultimatum to Sri Lanka, demanding the fighting to stop and Indian troops to be stationed on the island, to act as peacekeepers. President Jayewardene and other Sri Lankan rightist politicians briefly considered declaring war on India, but eventually realized they had no other choice. On 29 July Jayewardene and Indian President Rajiv Gandhi signed an accord that granted India a permission to station troops on Sri Lanka, granted a ceasefire between the SLA and the LTTE, but also demanded the LTTE to be disarmed in exchange for partial autonomy. Officially, India and Sri Lanka thus agreed to start a joint effort for establishing peace. This was to be supported by the deployment of 6.000-men strong Indian Peace-Keeping Force (IPKF) along the front lines between the LTTE and the SLA. The Indians were swift to react: one day later, they initiated the operation “Pawan” in which some 30 An-32s, six An-12Bs, and four Il-76MDs were used to deploy IPKF units and equipment to Palay. One day later, the main contingent of the IPKF arrived on amphibious ships, together with heavy weapons and MBTs, Mi-25 helicopters of the 125th and Mi-8s of the 109th and 119th Helicopter Units (HU) of the IAF. Initially, the Indians were successful in establishing a fragile ceasefire, but soon enough it became clear that there was a serious mistake in the organization of the whole process, as the LTTE was not included in the negotiations, nor asked if it would accept the ceasefire under given conditions. Worse yet: the Indians saw the LTTE as the creation of their RAW, and thus expected the Tamils to act according to their orders. The Tamils were not the least interested to do so. Also, the JVP, which meanwhile became immensely influential in the army, police and civil administration, suddenly re-emerged to launch a number of bomb attacks, killing up to 30 a day. By October 1987, when the IPKF was increased to 25.000, considerable tensions between the Indians and the Tamils developed. The Indians were now conducting intensive search of arms in an attempt to disarm the LTTE, while simultaneously arming other Tamil militias. The Indian Naval Aviation even used Breguet Alizé patrol aircraft to detect ships carrying supplies for the LTTE. It did not took much until a direct confrontation developed: already in the same month the Tamils started a series of attacks against the Indian troops in northern and eastern Sri Lanka, and in response the Indians moved on Jaffna. In October, several Indian Mi-8s deployed a larger group of commandos to Wassama, near Jaffna, with the task of conducting a swift search for weapons and ammunition. At the time, there were some 2.000 Tamil fighters in the area and in Jaffna, and these had different ideas about being disarmed: instead, they fired back, and a fierce fire-fight developed in which the Indian troops suffered heavy casualties. The Indians could not ignore such a “provocation”: the IPKF immediately launched the Operation “Pawan” (Wind), to capture Jaffna. Deploying a full mechanized division, equipped with T-55 MBTs and BMP-1 IFVs, towards north, the Indians attempted to block the Jaffna Peninsular from the LTTE bases in the east, while subjecting the city to heavy bombardments from the air and the ground. The first counterattacks of the Indian task force, however, were repulsed by Tamils using all the weaponry to their disposal. On 3 November, the Indians launched a new attack, supported by artillery, MiG-21s, Mi-25s and also HAL Cheetahs of the Army’s 664th Squadron – and failed again. It became clear that a much more massive assault would be needed in order for the Indian troops to crush the Tamil resistance. By the end of the month and a series of mechanized attacks, supported by artillery and hundreds of CAS sorties by MiG-21s, Mi-8s and Mi-25s, most of Jaffna was destroyed; the IPKF lost 262 killed and 927 injured troops, but the LTTE – even if losing a similar number of fighters – was still holding out. As a consequence, negotiations between the Indians and the Tamils were started, resulting in an agreement which saw the local LTTE units being disarmed in exchange for the IPKF troops pulling out of the area. The fact was, however, that most of the Tigers meanwhile lipped through the Indian siedge and disappeared in the jungle. The solution was again far from being perfect: the Indians were to be replaced by the SLA troops deployed in several small bases along the Jaffna Peninsula. However the LTTE was not the least interested in really acting according to any agreements. Instead, it started new attacks against the new local Army bases, and finally the IPKF, meanwhile increased to 50.000 troops – instead of controlling a ceasefire – ended attempting to defend own and the units of the Sri Lankan Army against the Tamils. Only by the mid-1988 – at which time the Indians had no less but 100.000 troops on the island – was the situation finally so far that the government in Colombo – meanwhile under leadership of a new President, Ranasinghe Premadasa – demanded a withdrawal of Indian troops. The problem was, however, that meanwhile the JVP was on a verge of seizing power. In order to curb the Sinhalese nationalists Premadasa had to end the Indian occupation. Therefore, he did something no Sri Lankan administration did so far: he opened secret negotiations with the LTTE. In 1989 these resulted in several significant developments: a ceasefire with Tamils was agreed, which were to stop ethnic cleansing of the Sinhalese, and the SLA would supply weapons to LTTE the depots of which were empty due to the Indian naval blockade. Under such circumstances Premadasa was first able to explain to the Indians that Sri Lanka is about to solve its own problems, and then also to organize relatively fair democratic elections. The people of Sri Lanka believed that a new and peaceful era was about to start, even if the clashes with the Tamils continued almost on a daily basis. The developments were to prove them wrong. Namely, meanwhile the Indians were to confront Tamils also elsewhere but on Sri Lanka. On 3 November 1988, the Tamils on Maldives organized a coup against the local government, and the Indian authorities saw themselves compelled to react. On the same afternoon, Il-76MDs of the 25th and 44th Sqn IAF deployed 1.600 paras to the Hullhule airfield, which was secured within minutes. In the following night, more Il-76MDs, but also some An-12Bs and An-32s, flew additional troops from Trivandrum, and also several Mi-8 helicopters to Maldives: in the course of this deployment, the coup attempt was spoiled, and its organisers fled aboard the merchant Progress Light, taking a number of hostages with them. On the morning of 4 November, the ship was detected by the Tu-142Ms and Il-38s based at Goa. After tracking it for two days, the Indians finally decided to board the ship: in a swift operation, commandos deployed by Indian Navy Sea King and Cheetah helicopters entered the ship, and fought the Tamils down, freeing the hostages in the process. Nevertheless, the coup on the Maldives, as well as the fact that even the presence of 100.000 Indian troops on Sri Lanka could not change the situation there as no LTTE fighters were disarmed, on 28 July 1989 the IPKF began a pull-out from the island, which was finished by March 1990. Despite democratic elections and an official ceasefire with the Tamils, the time between 1989 and 1990 was especially marked by terrible terror of the Army and the Police against the Sinchalese and Tamil minorities. There are estimates about 30.000 people being killed in these two years alone. This irresponsible politics of lynch finally lead to the outbreak of new large-scale fighting against the LTTE, that came to an end with a new ceasefire, declared on 21 December 1990. Elated about the end of the fighting, the then Sri Lankan Prime Minister Premadasa declared a victory in the war against the Tamils. That was a terrible mistake: the peace was to last exactly two days. By the time the last Indian troops have left Sri Lanka, the Sri Lankan Army became heavily dependable on Indian support: consequently, after the Indian pull-out, it needed a considerable reorganization in order to become capable of any kind of operations. In the course of this reorganization the SLA established a kind of a defensive line, running some 120km east from Malwathu Oya, through Nochchimoddai, and eight kilometres from Vavuniya, supported by a number of “fire bases”. A larger Army base was also built near Jaffna, and several others in NE Sri Lanka. The SLAF also established a base at the Palay airfield, deploying there several SF.260TPs, and SF.260Ws, which were to support ground troops if needed, and also tasked with blocking the shipping of supplies for LTTE from India. The Palay was actually under a constant pressure from the Tamils, even if not directly attacked: on 13 September 1990, for example, the LTTE shot down one of the SF.260TPs (CT-121) based there, killing the pilot. The situation was now to worsen, as the Tamils started increasing the pressure on SLA units in northern Sri Lanka, cutting off their supply lines: soon enough, the transport aircraft of the SLAF became the main mean of communication between the bases in the north and the south. On the start of the war with Tamils, the SLAF operated only two C-47s and one Bae HS.748 transport, which was obviously far from being enough. By late 1986 this force was considerably increased: two more HS.748s were purchased, one from the UK and another – via a Belgian agent – from Burma. By the end of 1987 also four Harbin Y-12s and two Shanxi Y-8s were purchased in China. In 1990, the government increased the defence budget by 15% and the SLAF was authorized to acquire three more Y-12 and two HS.748s. This fleet of 14 transport aircraft was of ultimate importance for the survival of SLA units isolated inside their bases in northern Sri Lanka, and was therefore used to the utmost, flying several hundreds of sorties per aircraft each year: they transported weapons, ammunition and supplies to Palay, and evacuated injured troops to the south. The use of the Y-12s, for example, was so heavy – especially in the MEDEVAC-operations – that parts of their construction started to corrode due to the damage caused by the blood! The process of the development of the combat components of the SLAF, however, was not as successful. The MiGs supplied by the USSR in 1972 were all retired by 1979, and no replacement for them was purchased. Only in 1991 was the SLAF to be reinforced by two Shenyang FT.5s, five FT-7s, and two FT-7Bs. The number of two-seaters was relatively high, but they were required for training of additional pilots required as the service was to be increased in strength. Nevertheless, most of the Chinese-supplied fighters were soon unserviceable, one of the reasons being that they were not built for intensive operations – especially not under the climatic conditions on Sri Lanka - while the spare parts support was irregular, and the other that their crews were detached to other units in the course of SLAF's considerable expansion. Therefore, the old SF.260s - only eleven of which remained intact by late 1989 - remained the main combat asset of the air force; the number of fully operational examples was actually far lower, and new airframes were obviously needed. The connections to a Belgian agent in Burma/Myanmar were now activated again, and in 1990 a total of 14 new SF.260s were purchased. Simultaneously, the Sri Lankans also declared their interest in acquiring several Fairchild A-10A Thunderbolt II fighters from the USA, but Pentagon turned any such requests immediately down. Therefore, by late 1990, the SLAF was actually only in a slightly better condition to fight the LTTE then before the Indian intervention. The main combat type remained the SF.260, the number of which was only slightly increased. The number of Bell 206 and Bell 212 helicopters was actually slowly decreasing due to combat attrition and wear, and the transport fleet was under such a strain that it was likely to break down under the strain of continuous intensive operations. In 1991 a total of four F-7BS' were purchased by Sri Lanka. They were serialled CF704 thru CF707 and entered service with the No.5 Squadron, based at Katunayake AB. In addition also two Guizhou FT-7Bs were purchased, of which one - CF703 - remains in service with the same unit until today, together with additional F-7BS', acquired subsequently (serialled CF708 upwards). The whole fleet was mothballed for a better part of the 1990s for lack of crews, which were needed in the course of expansion of other units. On 2 January 1991 the Tamil Tigers initiated a simultaneous large-scale attack on almost all the SLA bases in northern Sri Lanka and terrorist attacks against a number of Army installations around the country. During one of these attacks also the Sri Lankan Defence Secretary was killed. In the northern Sri Lanka only those Army bases remained intact, which were not disturbing the LTTE all too much. The SLAF CO, Air Chief Marshall Fernando, immediately ordered a counterattack, Operation “Thunderbolt”, tasking his units to strike Tamil bases and supply routes, so to prevent additional attacks. The operation, however, failed, and in the following days a suicide commando of the LTTE detonated another bomb in the middle of Colombo, killing no less but 200 civilians. By mid-1991 most of the remaining SLA bases in northern Sri Lanka were cut off and could be held only due to supply from the air. On 10 July the LTTE finally overrun also the SLA positions on the Elephant Pass thus cutting the last land connection between Palay and the rest of Sri Lanka under government control, and putting this important air base under a siege. The SLA immediately launched a large counteroffensive, deploying 8.000 troops along the western coast of Sri Lanka. After 24 days of terrible and extremely bloody fighting, these had to inflict a loss of 564 fighters to the LTTE before managing to break through to Palay and Jaffna at a cost of 200 dead and 600 injured soldiers. On 10 September, the SLA started the next offensive, “Lightning Strike”, against the rebels in the Mullaittivu jungle, while the Sri Lankan Navy – this time in cooperation with the INI – established a naval blockade of the Jaffna Peninsula. The large-scale operations of the Sri Lankan military were initially successful, to a large degree due to intensive CAS sorties flown by SLAF SF.260s and helicopters. But, in the end the units which broke through the Tamil positions were cut off by new LTTE operations behind their backs. It was again the SLAF on which the survival of a good part of the troops on the ground depended. The Air Force was already equipped for such emergencies, as it chartered a number of Y-8M medium transports (Chinese copy of the An-12B) from China. However, one of these crashed on 5 July near Iyakatchitchy (at the time held by the Tamils), killing all 20 crew and passengers, while transporting weapons and spare parts for the SF.260s at Palay. The LTTE claimed to have shot this plane down: certainly, the Tamils were improving their air defences and even if the Y-8 was not shot down by them, several days later they certainly have downed an SF.260TP over Jaffna. The situation remained very much the same for most of 1992 and 1993, until PM Premadasa started new negotiations with the LTTE. The Tamils, however, used the short break to reorganize their units and then start a new – and so far most murderous – offensive. In March 1993 a suicide Tamil bomber killed Premadasa and a number of top Sri Lankan politicians. Six months later, a new wave of attacks broke out: in the north, some 4.000 LTTE rebels overrun the Army base near Pooneryn, killing no less but 750 SLA troops in the process. This offensive was followed by a new wave of suicide bombings, which killed almost all the Sri Lankan political leaders and hundreds of civilians. The war was now obviously developing into previously unknown dimensions, and the Sri Lankan military was not in condition to win it. After the two losses in July 1991, the condition of the SLAF deteoriated considerably and the authorities were searching for sources ready to supply new arms and help in the fighting against the LTTE. The main problem of the Sri Lankans was, that hardly anybody was ready to supply them weapons because of human rights violations committed by the military and the police. Nevertheless, in 1993 the Israelis connected the Sri Lankans with Argentina, and this connection ended with the acquisition of four IA.58A Pucara COIN aircraft for the SLAF. In the same year also Mi-17s were purchased in the Ukraine: for service in Sri Lanka all were equipped with armor under the cockpit floor, and IR-filter boxes over the engine exhausts. The first three examples arrived aboard an An-124 transport, on 15 March. Also from the Ukraine the SLAF purchased reinforcements for its badly strained fleet of transport aircraft, but more about this later. The series of Tamil suicide attacks continued by the end of 1994 with such intensity, that it seemed as if Sri Lanka would be left without even a single active politician. Aside from political, the LTTE suicide bombers targeted also military installations. On 2 August 1994, for example, several of them penetrated the perimeter of Palay AB and attacked a Bell 212 of the 4th Sqn with RPG-7s just at the moment it was about to start. The helicopter was badly damaged, and in the following fire-fight several Tamils and two soldiers were killed. Although the airfield was subsequently secured, all the remaining helicopters and aircraft had to evacuated. Even if in the same month another ceasefire was agreed, three months later the Tamils attacked again, this time destroying two patrol boats of the Sri Lankan Navy inside the port of Trincomale, killing 12 crewmembers. Curiously, the attack was announced to the authorities two hours in advance, but the military failed to issue a warning in time. It was not before spring 1995 that the SLA – after getting some new weapons, including a number of Type 59 tanks from China, together with some APCs – was finally ready for a larger counteroffensive. In April, a large offensive against Jaffna was initiated by a series of air strikes flown by F-7Bs, IA.58As, and helicopters against LTTE bases in the Batticaloa area, thus starting a period known as “Eelam War III”. After 50 days of bitter fighting the city fell, but once again the LTTE fighters successfully escaped across the Jaffna-Kilali lagoon. Indeed, a response from the LTTE was not long in wait: by the time, the Tamils have got several SA-7s, and they were now to use them in combat for the first time. The story of the arrival of these weapons in Sri Lanka is definitely an interesting one, then it again shows the interconnection between the LTTE and different terrorist organizations, but also the – usually completely ignored – involvement of Pakistan in supporting world-wide terrorism. Namely, in the second half of 1994 the LTTE helped the Harkat-ul-Ansar (since renamed as Harkat-ul-Mujaheddin) – a Pakistani terrorist organisation run by the Inter-Service Intelligence (ISI) – in smuggling at least two shiploads of arms and ammunition from Kharachi to the Philippines, where these were delivered to the Moro Islamic Liberation Front. In return for this favour, the ISI supplied an unknown quantity of either Egyptian- or Pakistani-made SA-7 MANPADs, as well as anti-aircraft guns and ammunition. By April these weapons were on Sri Lanka and several groups of Tigers were trained on them: the LTTE was now to use a weapon supplied from the ISI against the SLAF. On 28 April 1995 the Tamils brought their SA-7s to bear, hitting a SLAF HS.748 while on approach to Palay. The transport crashed outside the base perimeter, killing 43 – most of these SLAF personnel. Only few hours later, another HS.748 was hit by an SA-7 only few kilometres before landing in Palay. This time 52 crewmembers and passengers were killed, again most of these SLAF personnel. This loss of 100 servicemen and two transport aircraft within only few hours proved not only catastrophic for the Sri Lankan Air Force, but now also all the 20.000 SLA troops stationed on the Jaffna Peninsula were definitely cut off from their supply bases. Under the given conditions, the government was forced to deploy emergency measures. Six Mi-24Vs were purchased in the Ukraine, entering service with a new unit – No.9 Squadron, based at Minneriya/Hinnurakgoda AB – and on 22 May the USA finally permitted Israel to supply two IAI Kfir C.2s and one TC.2s to SLAF. Also, several larger loads of infantry weapons were purchased directly from Pakistan. The new weaponry enabled the SLA to prepare a new offensive, this time with the task to open a corridor of at least three kilometres behind the runway at Palay, so to enable transport aircraft to land safely there. Simultaneously, a narrow strip between Vavuniya and Kilinochchi – 65km north of Jaffna – held by the LTTE was to be cleared as well. Deploying an equivalent of two mechanized brigades, supported by artillery and combat helicopters, the SLA moved rapidly along the roads linking Kilinochchi, Vavuniya and Mullaittivu. Initially, the troops meet weak LTTE resistance. They advanced for between six and ten kilometres without any significant problems. The the units began blundering into a series of ambushes. The LTTE was well equipped with anti-tank weapons and the Sri Lankan reconnaissance was insufficient. The Tigers extracted a heavy toll from SLA units, several of which almost fell apart from heavy blows they received. As the Sri Lankan reinforcements arrived battles were joined at close range, with several towns changing hands a number of times in hand-to-hand fighting. The planned lightning offensive bogged down in a merciless battle of attrition. The SLA would not give up despite a costly failure. On 9 July 1995 it launched a new operation, “Leap Forward”, deploying 10.000 troops with the task of breaching out from Jaffna towards the south, and establishing a land corridor. The Operation Leap Forward saw two Brigade-strength task forces, lead by MBTs, pushing from Palay towards Array: both were stopped within hours of starting their attacks, and the SLAF was committed with full force in order to save the troops on the ground from being cut off from the base in Palay. The Pucaras and SF.260s flew dozens of combat sorties, unleashing hundreds of unguided rockets and bombs on the LTTE. Not all the strikes hit military targets: in at least one case, a church was hit in which 150 Tamil civilians were seeking refuge, but the air offensive was continued. On 14 July, finally, the LTTE brought another shipment of SA-7s to the front, and on the same day a Pucara was hit by one of the missiles. The pilot, Flt.Lt. Pereira, was killed when his plane hit the ground. Only two days later, the Tamils delivered the next blow, when another of their suicide commandos penetrated the naval base in Kankesanturani and blew up the patrol boat Edithare. Meanwhile, the transport units of the SLAF did their best in order to help the Army. While the remaining Y-12s, Y-8s, and HS.748 re-started the air-bridge to Palay, they were reinforced by three An-32s chartered from Kazakhstan together with their crews. Also, the newly delivered Mi-17s of the No.6 Sqn flew supply missions for Army bases near the Elephant Pass, Mannbar, Mullaittivu, and Pooneryn. The significance of these flights was such, that they were continued also by night, even if most of the crews lacked proper training and equipment. In the face of the Tamil suicide attacks all these efforts were seemingly in vain. In fact, in August 1995 the LTTE committed a new series of bombings, this time against police stations all around Sri Lanka. Despite losing at least 180 fighters in this operation alone, similar attacks were even intensified. In late August, for example, the rebels captured a ferry and used it to close upon several patrol boats of the Sri Lankan Navy, which were then attacked with multiple-rocket-launchers and heavy machine guns, and destroyed. Losing patience, in September the SLA deployed 30.000 troops which broke out of Palay and captured nine LTTE bases on Jaffna Peninsula and further to the south. The SLAF received the first two Shaanxi Y-8s (Antonov An-12s licence-built in China) in 1987. One of these, serialled "CR-872", was shot down on 5 July 1992 while on approach to Jaffna, killing 20 on board. The second example, "CR-871", was grounded shortly after due to technical difficulties. After losing also two HS.748 transports in spring of 1995, in emergency the SLAF loaned this Y-8 from China. The aircraft was serialled "CR-873". While some contemporary reports indicated that it was returned subsequently, it was outright purchased and continued soldiering with SLAF until crashing in a non-combat related accident, on 15 August, 2002. All the SLAF transports saw heavy service while supporting the air-bridge from Katunayake AB to Palay airfield, in the mid-1990s: they were used for hauling reinforcements and supplies to Jaffna, and evacuating casualties to such a extension that several aircraft suffered corrosion damage from blood. Also, the runway of Palay airfield saw such heavy use, that it is considered as in need of repairs already since several years. After finally gaining some ground on Jaffna, the SLA immediately regroupped its forces and launched a new operation, “Riviresa”, with the target of securing the City of Jaffna and establishing a safe corridor to the south. Jaffna was – despite all the fighting in the area – still the main base of the LTTE in the area, and one of most important links in their supply chain: the Sri Lankan government had no authority over the city already since 1985. Operation Riviresa was to change this: initiated in late November by some 20.000 troops, this offensive was successful, and by 3 December the whole city was under the control of the SLA, after at least 1.700 Tamil fighters were killed. In the course of Riviresa also the SLAF Mi-24s were introduced in combat flying their first combat mission son 14 November 1995. Nevertheless, the LTTE hit back time and again, and on 18 November even smuggled several Oerlikon 20mm anti-aircraft guns under the landing pattern of Palay: several of these were used to hit an Y-8 transport on the same day. The pilot managed to land the aircraft on the runway, but four crewmembers were killed and five injured as the plane overshot and crashed into the sea behind the runway. Only four days later, another painful blow followed, when one of the chartered Kazakh An-32s was shot down during a landing in Jaffna, and all 63 troops aboard killed. With this, the SLAF suffered a loss of two HS.748s, two An-32s, one Y-12, 19 pilots and co-pilots, and 132 other soldiers in less than eight months, or a total of more than 15% of its equipment and personnel, without inflicting any serious damage to the enemy in exchange. Nevertheless, the Operation “Riviresa” was a heavy blow for the LTTE, even if the Tamils were not to run away, then most of their remaining fighters were evacuated, together with some 50.000 civilians, from Jaffna. Instead, they changed their tactics and executed several new suicide attacks: one of these, executed in early 1996, killed 100 civilians, and injured over 1.400. In response, the SLAF used its newly delivered Kfirs to deliver heavy strikes against the small airfield near Iranamadu, some 80km south of Jaffna, which was used for flying in supplies from India. On 11 March, two additional strikes hit the LTTE bases near Mudavankerni and Kandalady. On the same day, however, some 300 Tamil fighters ambushed a SLA commando unit near Batticaloa: before the soldiers fired even a single shot in response, 23 of them were killed. Two Mi-24s attempted to find the rebels which set up this ambush, but were not especially successful. As it became clear that the LTTE was not significantly disturbed due to the loss of Jaffna, on 21 April 1996 the Operation “Riviresa 2” was initiated, with the target of neutralizing the last remaining rebel formations on or around the Jaffna Peninsula. Again two SLA task forces were deployed, and – supported by more Kfir-strikes – this attack was successful in pushing the Tamils completely out of the area without any own losses. It was still not over, however; as then the Operation “Riviresa 3” had to be prepared and executed in order to mop-up the last remaining LTTE-fighters in the Jaffna area, and in NW Sri Lanka. Of course, the preparations for a new operation showed that despite all the claims about success of previous operations, some Tamil rebels were either still active in the area, or tried to return back to their main base and operate from there; for the Sri Lankan population, however, this meant that the war was still far from over. In January 1996 the SLAF received the first two Kfir C.7s and a single Kfir TC.2. These entered service with the newly-established No. 10 Squadron, based at Katunayake. Both C.7s were soon in action against the LTTE, frequently operating from airstrip at Iranamadu, some 80km south of Jaffna. In operaitons, however, the Kfirs proved to have a lower bomb-carrying capacity and endurance than the MiG-27s, subsequently acquired from the Ukraine. Some losses occurred as well: the Kfir depicted here, serialled "CF-712" was lost already on 21 January 1997: pilot ejected after experiencing unknown technical difficulties and the plane crashed into the Negombo Laguna. The Operations Riviresa 1 and 2 saw the so far most intensive flying for the SLAF, many flying crews of which were inexperienced and had to “learn by doing”. On 19 March, for example, the Mi-24 (“CH-614”) was shot down into the Bay of Bengal off Mullaittivu, killing seven passengers, and several days later a Kfir C.2 crashed, finally forcing the whole air force to cancel operations for four days: due to the lack of a proper radar net, the crash-sites in both cases were never localized, and therefore the full reasons for these two accidents never cleared. Nevertheless, in general, the young SLAF pilots performed admirably in action, despite the lack of training, experience, the general circumstances, and the strain: how intensive the flying was, shows the fact that a co-pilot of one Bell 212 flew no less but 21 hours (of course, with several smaller breaks in between) within one day, while another pilot flew no less but 152 hours within only one month (many NATO pilots would not fly as much the whole year at the time). At such tempo even the most inexperienced pilots became seasoned combat veterans within the shortest periods of time, even if their combat experiences were unlikely to completely equalize the lack of a proper training. During the Operations Riviresa 1 and 2, the SLAF foremost flew Kfirs and Mi-24s for CAS, although also some SF.260TPs and SF.260Ws were used – at the usually very high tempo of operations. As there were still not enough pilots and ground personnel to man all aircraft, the remaining FT-7s and F-7Bs were meanwhile mothballed and stored in the hangars at Katunayake AB, and all their crews transferred to other units. Something similar happened with the remaining three Pucaras: the SLAF run out of spare parts for them already in the early 1996 and after another Pucara crashed during a combat sortie the whole fleet was subsequently grounded. Yet, while the intensive flying was certainly useful for Sri Lankan pilots, it put especially heavy strain on technical personnel, which was not only equally inexperienced but time and again also lacked the means and time to properly maintain the aircraft. Because of this, a number of aircraft was permanently non-operational, and the SLAF was finally forced to start sending larger groups of technicians to Bangladesh and Ukraine for training. To make matters worse, the quality of training outside the country was not always satisfying, and from late 1998 the Sri Lankans were forced to re-start training their pilots and ground personnel at home again. Nevertheless, in 1997 they introduced also some local-produced weapons, such like 50kg bombs and unguided rockets calibre 68 or 70mm. Both of these weapons were foremost used from the Mi-24s, but also from SF.260s, Pucaras, and Mi-17s. The success of the operation Riviresa 3, finally undertaken in the early 1997, did not bring any respite for the SLAF: actually, it only resulted in more problems as the LTTE would not admit a defeat at Jaffna, but instead started a series of heavy attacks against the SLA bases along the defensive lines, and further to he south. On 5 March 1997, for example, two suicide bombers penetrated the airfield at China Bay and exploded one of the Y-12 transports stationed there. Only a swift reaction on the part of the guards precluded an even worst catastrophe in the following minutes, as the whole base was alerted in time to defend against an onslaught of several hundred Tamils. Even less lucky was the base in Mullaittivu, in August 1997: it was overrun by the LTTE and no less but 1.200 Sri Lankan troops should have been killed in that attack. Even the large airfield at Vavuniya was put under such a heavy pressure at the time that all the eleven Mi-17s of the No.6 Sqn stationed there had to be evacuated. The SLAF suffered additional losses by the end of the year, as on 12 September a Mi-24 was badly damaged by ground fire, while another was shot down on 10 November 1997. Despite such problems, by autumn 1997 the SLAF managed to stabilize the number of trained crews and considerably improve their situation. The number of ground personnel was still insufficient but at least they found opportunity to repair and return to service at least three Mi-24s which were grounded for lack of spares and maintenance and stored at Katunayake already since 1995. They were now deployed not only for attack sorties, but also for supporting Mi-17s and Bell 212s. The number of available helicopter crews was increased in so far that none had to fly as much as only one year earlier. The Kfirs of newly-established No.10 Sqn, which was activated in January 1996 at Katunayake AB, were now constantly supported by at least two contracted Israeli instructors. Meanwhile, the remaining two intact HS.748s were retired due to being word out and also problems with spars supply, but the SLAF was reinforced in the early 1998 when the No.11 Flight was formed and equipped with several IAI Super Scout reconnaissance drones, acquired from Israel, and based at Anuradhapura. One of these was lost – probably to ground fire – after only few days of operations, on 16 January of the same year, but the others proved their worth beyond any doubt. The SLAF purchased at least 12 Mi-8 and Mi-17s since 1993. The first examples were acquired in the Ukraine and were in relatively poor condition. Subsequently all were overhauled and have got completely new camouflage, usually consisting of light earth and green. In 1998 the LTTE again began executing political assassinations, but also targeting civilian objects. In January 1998 a truck bomb was planted near the Temple of the Tooth, an important religious and tourist site in Kandy. Eight were killed and the temple, nearby businesses, and a hotel, were damaged. The LTTE’s “Sea Tigers” also attacked several commercial ships north and east of Sri Lanka, before the “Black Tigers” began threatening air carriers flying between Colombo and Jaffna. In September 1998 an AirLanka passenger aircraft crashed near Jaffna, killing all 20 on board: the LTTE was of course suspected of having shot it down by SA-7s. On the battlefields, by September the SLA meanwhile captured two thirds of the highway between Kilinochchi and Vavuniya, and mopped up the area around Mankulam. But, the rebels then counterattacked and captured Kilinochchi, in the end forcing the government into defensive again. And, terrorist attacks were continued: in September 1999 several bombs were detonated in buses in separate incidents in Negombo and Badula. In total, over 30 people were killed and 143 injured in terrorist attacks that hit Colombo, Trincomale, Batticaloa, Jaffna, and Medawachchi in that year. In January 2000 a suicide bomber killed at least 12 and wounded 20 when detonating her bomb outside the Prime Minister’s offices. Seven bombs were detonated in public buses in Colombo and other cities in February 2000, killing three and injuring over 140. Additional bombs on trains and train roadbeds caused one dead and over 50 injured. In March eight LTTE terrorists attacked a column of government vehicles in Colombo, killing 25 and injuring over 100. Three months later, in June 2000, a suicide bomber assassinated the Minister for Industrial Development, also killing 21 others and injuring 60. In October two additional attacks occurred: a “Black Tiger” bomber confronted by police exploded his device rather than to surrender, seriously injuring several Western tourists in central Colombo, and another killed five and injured 16 after being stopped by police in vicinity of an election rally in the capital. In reaction, in May 2000 the government activated provisions of the “Public Security Ordinance”, granting specific authorities sweeping powers to deal with different threats. The situation for government worsened especially in May and June 2000, when the LTTE overrun the SLA garrison on the Elephant Pass, near Jaffna. In total, between November 1999 and June 2000 the Sri Lankan government lost most of the land it secured during the Riviresa 1, 2, and 3. By the time the 30.000 Army troops at the Jaffna Peninsula were under such pressure by the LTTE, that Indian began preparations for their eventual evacuation. In addition, on 24 May 2000 another SLAF Mi-24 was shot down: this time by a MANPAD, the strike of which killed both gunners, even if the pilot subsequently managed to crash-land the badly damaged helicopter, and escape safely, together with co-pilot, after landing in government-held territory. Therefore, through the rest of the year SLAF changed its tactics and began flying a series of interdiction strikes against LTTE camps in the Trincomale area, especially during the Tamil offensive on Jaffna peninsula. Most of these were undertaken by Kfirs: their high speed was protecting them from enemy MANPADs and AAA, while their highly accurate and simple-to-use navigational platform ascertained high precision of attacks, despite the use of iron bombs. Clearly, they were far more convenient for this kind of operations than Mi-24s. Interestingly, the US-supplied C-130Ks, delivered already in March 2000, were hardly used, despite their certainly significant transport capabilities: all were grounded due to the lack of support equipment and cracks in engine exhausts. Sporadic strikes continued through the whole summer and autumn 2000, eventually provoking the Tigers to acquire additional MANPADs and hit back. On 19 October a Mi-24 was shot down near Nogar Covil, and four days later, on 23 October 2000, the LTTE launched a massive assault on Trincomale harbour, in which two Sri Lankan naval vessels and two passenger ships were badly damaged. When the SLAF appeared to pursuit the raiders one of its Mi-24s was shot down by MANPADs. The SLAF continued pounding Tamil positions nevertheless, and on 31 October the LTTE base at Upparu, near Trincomale, were hit again. After a lengthy investigation in this case, in December 2001, the Sri Lankan military published a report according to which the LTTE was meanwhile acquiring even sophisticated US-made FIM-92A Stinger MANPADs from ISI, and used these against the SLAF. The final evidence was provided through a video captured from Tamils in October 2000, showing several of them carrying Stingers. Through autumn scores of SLA troops and Tamil rebels were killed in sporadic clashes through northern Sri Lanka, as both sides were searching to ambush or hit back. A typical day was 1 December 2000. In the afternoon the LTTE ambushed a SLA convoy near Jaffna, blowing up two Buffel APCs, and killing 14. 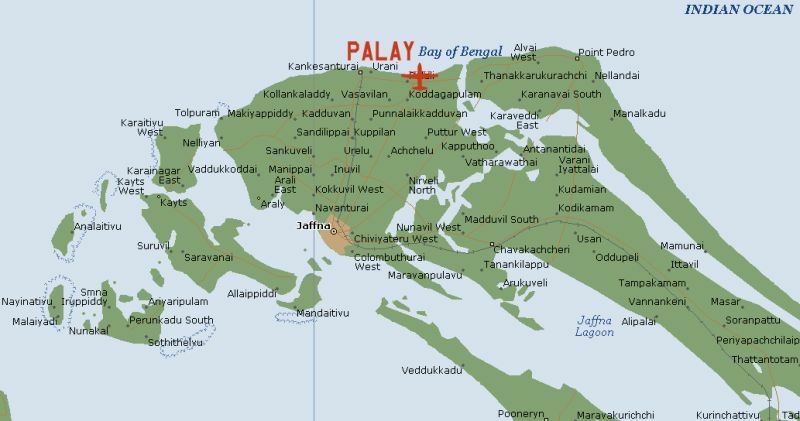 Only hours later SLAF Kfirs bombed a Tamil naval base near Palay, on the Jaffna peninsula, killing at least nine – according to SLAF spokesman, Brig. Sanath Karunaratne. With such an exchange being an almost daily occurrence, it was clear that neither side could win, despite the fact that the rebels have stepped up their recruiting in areas under their control, and that many teenagers either volunteered, or were coerced, into service. Between 1997 and 2000 the effective total capability of the SLAF was considerably increased – mainly through acquisition of aircraft and helicopters from the Ukraine. This process began almost unnoticed already in 1993, when the first three Mi-17s were acquired from the Ukraine. Additional examples were added in the following years. In 1995 also the first six Mi-24s were purchased from the Ukraine. Although arriving in Sri Lanka already in quite a worn-out condition, they proved ultimately effective, and became one of the SLAF’s workhorses. Initially, the No.9 Squadron operated only three examples, while the other three were put in storage. After two Mi-24s were shot down and one badly damaged, in 1997, however, the remaining three were rushed into service and six new ordered from the Ukraine. To replace losses, four Mi-24s might have been delivered in 1997, and three additional examples followed in 1998, bringing a total of these gunships probably supplied to SLAF to as high as 16. However, their attrition was heavy, and it is understood that by 1999 only seven remained operational. Therefore, even the arrival of sturdy and reliable Mil-helicopters was not to prove as decisive for this war as the following acquisition. As already mentioned, in May 1995 the SLAF was granted the US-permission to acquire IAI Kfir C.2 fighter-bombers from Israel: on 1 January 1996 the No.10 Squadron was activated, and seven days later it received the first two Kfir C.2s single-seaters and one TC.2 two-seater. Two additional C.2s arrived in April. The unit was based in Katunayake AB and was immediately rushed into extensive strikes against LTTE bases and positions. The type proved relatively expensive to operate, while limited in regards to amount of weapons it could carry on a single mission. Consequently, the SLAF was searching for a fighter-bomber with greater combat persistence. In May of 2000 the first MiG-27Ms were purchased as well. Initially, their acquisition was a great secret, then the aircraft were noticed in SLAF camouflage and markings – but still under overhaul in Lvov, Ukraine – already in early June of that year, but reported in public only much later. Their operations in Sri Lanka, where they entered service with the No.5 Squadron on 25 June, commenced on 8 August 2000, when three aircraft flew a rocket attack against LTTE positions in the Jaffna area. In December 2000 three additional MiGs – including two MiG-27Ms and a single MiG-23UB – were delivered. Simultaneously with MiG-27s, the SLAF acquired also three refurbished Lockheed C-130E Hercules transports, purchased from the USA in October 2000 for $8 million. Their capabilities proved ultimately important for keeping the air bridge to Jaffna open, thus sustaining the combat capability of local SLA units. Despite delivery of MiG-27s, the SLAF continued purchasing Kfirs as well, in order to diversify its sources. In December 2000 four additional C.2s arrived, and Sri Lanka then ordered four C.7s as well, which went through an extensive overhaul at IAI Lahav Division before delivery. The SLAF infrastructure development was not keeping pace with this massive expansion in aircraft inventory. The available installations, including hangars, engineering facilities, storage facilities and - more importantly - the number of qualified and experienced technical personnel was not sufficiently increased to keep up with the increased workload. Consequently, new aircraft had frequently to be stored for months until they were taken into service. In addition, a large number of Israeli, Ukrainian, Russian and later Chinese technicians and instructors were contracted to work with the SLAF. As especially the East Europeans and the Chinese did not speak English, this caused considerable problems – and additional expenses, then specially-trained interpreters were needed for communication with them as well. In addition to Kfirs and MiG-27s, also the first five (out of eventual ten) China National Aero Technology Import & Export Corporation (CATIC, in Nanchang) CJ-6 basic trainer aircraft, three additional Mi-35Ps, and three An-32 transports were purchased in the year 2000. The Chinese influence was soon to increase, then on 13 November 2000 the C-in-C SLAF, Air Marshal Jayalath Weerakkody ordered also six China Nanchang Aircraft Manufacturing Corporation (NAMC) K-8 Kharakorum jet-trainers during his visit in Pakistan. For the SLAF, the K-8 was foremost important as jet trainer, but this aircraft very much had a secondary role of ground attack, having the capability to carry payloads of up to 945kg, including 23mm gun-pods, rocket launchers, and light bombs, as well as PL-7 air-to-air missiles. In late 2000 the SLAF received a second batch of Kfir C.7s from Israel. These aircraft were all refurbished by IAI before delivery, and show few minor differences compared to the first batch, including the addition of RWR-blisters under the cockpit, as well as aerials on the spin. Interestingly, they do not wear national markings, only serials and the name "Kfir" bellow the cockpit. Also of interest are titles "SLAF" applied on the underside of the fuselage, near the rear edge of the wing. When it comes to LTTE, by the early 2001 it boasted approximately 10.000 fighters, with between 3.000 and 6.000 trained reserves. These were supported by significant support structure spread in North America, Europe and Asia, including fundraisers, arms dealers, and lobbyists working with different foreign governments as well as in the UN, but also involved in international criminal activities – including partnership with Pakistani heroin producers and traffickers, and blackmailing. Having thus brought almost every aspect of public life in areas under its control, the LTTE could thus be described as a prototype of a “successful” modern insurgency. On the battlefield, however, in late 2000 and early 2001 the Tamils were not especially successful. Namely, during the bloody fighting in Jaffna, in September 2000, over 300 rebels were killed and the LTTE was forced out of the city. Following this defeat, and as the Norwegian intermediation gained momentum, on 24 December they announced an unilateral ceasefire, conditioning the stop of fighting on “serious” negotiations with the government. The government had different ideas, however. On 16 January 2001 the SLA launched the Operation “Kinihira IX” (“Anvil 9”), targeting LTTE positions south of Kilali. Within two days it captured some seven square kilometres between Kilali and Eluthumadduval, but then the advance was stopped by concentrated artillery bombardments of the LTTE. For several days the SLAF MiG-27s and Kfirs were striking suspected positions of Tamil artillery, before on 22 January the SLA launched a surprise night-time operation, and captured another eight square kilometres, including the key junction of Muhamalai, some 2.5km from the Jaffna-Kandy highway – the main route from the mainland to Jaffna. Regrouping its forces, on 4 February the Stage II of “Kinihira IX” was initiated. As first, on the evening the MiG-27s and Kfirs raided ten suspected LTTE fire-bases silencing a number of artillery pieces. Several other SLAF jets then hit the LTTE strongpoint and a bunker line in the Sorampattu area, approximately 8.5km north of Elephant Pass. The strongpoint received several direct hits that caused a massive secondary explosion: obviously one of the most important LTTE ammunition and fuel dumps was established here. In the following night the SLA launched another night attack, proceeded by commando and special forces troops equipped with night-vision goggles (NVGs). The commandos raided the the LTTE defence lines and five camps along the A9, killing some 33 rebels for the loss of two and six injured. The Tamils were caught off-guard and withdrew in the face of the onslaught. In the morning SLA troops launched a pursuit, fighting a number of skirmishes. This time the army was too swift: not recognizing the main threat axis and with its artillery in disarray, the LTTE was unable to bring down concentrated artillery and mortar bombardments in response. The SLA troops thus consolidated their gains in the Muhamalai area and brought in their own artillery. Artillery duels lasted the whole day, before the SLAF started bombing LTTE positions near Wanni and due east of it. Two Kfirs were also seen attacking LTTE positions near Trincomale: targets near villages of Chenaiyoor, Kaddaiparichchan, Samboor, and Soodaikuda, some eight kilometres south of Trincomale, were hit by additional air attacks. Despite the blows they received, the rebels lengthened their unilateral ceasefire, attempting to release the pressure brought upon them. The government ignored this and the fighting continued with additional offensives in the Jaffna area. Eventually, the LTTE started violating even its own ceasefire, and on 24 February the Tigers attacked a police detachment near Trincomale, killing two police officers. Nevertheless, in the meantime Norwegian diplomats became active, attempting to bring the government to enter peace talks with rebels, negotiate a ceasefire, and a force of international monitors. Initially, Norwegian efforts appeared to be useless, then the government continued refusing to negotiate, while the LTTE was conditioning its participation on conditions it was sure the government would never accept. Besides, the fighting was going on – not only on the ground. By late February 2001 the No.5 Squadron had a total of 13 MiG-27M-qualified pilots and was participating in the war as often as possible, flying 73 combat sorties since August 2000, and dropping over 700 tonnes of explosive ordnance. In the course of these missions they were three times targeted by MANPADs; none of these ever came near any of the aircraft, but one was damaged by ground fire. With understandable pride, on 9 March 2001 the SLAF marked its 50th anniversary, staging an imposant display of its newly-acquired hardware and an air show. The claim of the C-in-C Jayalath Weerakkody that the SLAF acquired more than 50 aircraft over the last year was slightly exaggerated, but it was sure that by the time his service was more effective than ever before. Having a problem to reach and hit back on SLAF, the LTTE turned against the Sri Lankan Navy, and on the early morning of 21 March staged a suicide attack against two Israeli-built Dvora-class gunboats as these were underway from Trincomale to Kankasanthurai, sinking one of them off the coast of Mullaittivu. While 12 of the crew were recovered by helicopters and ships rushed to the scene under cover of SLAF fighter-bombers, seven sailors were declared MIA. The SLAF’s revenge was almost immediate: on 22 March at least four MiGs and Kfirs bombed one of the most important LTTE-training bases, the so-called “Beirut Base”, situated in the Batticaloa district, killing up to 20 rebels, and injuring 30. On 31 March MiG-27s hit several Tamil positions in the Nagarkovil area, killing at least seven Tigers, and two days later the SLAF – meanwhile reinforced by arrival of six Chinese-built K-8 Kharakorum training jets – hit again the “Beirut Base”, claiming to have killed 18 rebels. On 10 April the turn was on two LTTE-bases in the north of the Jaffna peninsula: a fire-base of Tigers near Muhamalai, close to the Elephant Pass, and the nearby Sea Tigers base. By the time, it became obvious that the Tamils were heavily hit by such strikes, then the LTTE issued an official demand such raids to be stopped as a precondition for peace talks. The negotiations were actually going on all the times, but brought no results: although the Tigers had renewed their truce three times, demanding the government to halt fighting, the government countered that the truce was a ruse and that the rebels were only regrouping. The Tigers had renewed their truce three times, and demanded the government also halt fighting – then 160 LTTE-fighters should have been killed and 400 injured since they declared the unilateral ceasefire – and lift a ban on the organization so that peace talks could begin. The government countered the LTTE broke ist own ceasefire on no less but 224 occasions since 24 December, and that the truce was a ruse used by the rebels for regrouping. Ever since arriving in Sri Lanka, in August 2000, the MiG-27M became the backbone of the SLAF. The MiG's excellent navigational and fire-control systems excelled in attacks on LTTE bases. The type is known to have caused heavy losses and was eventually the reason behind the subsequent Tamil raid against Katunayake AB, in July 2001. In SLAF service, the MiG-27Ms were all painted in a colour very similar to Light Ghost Grey overall. National markings were downsized to minimum, and the serial is also applied in very small characters on the fin. On 25 April 2001 the unilateral ceasefire declared by the LTTE ended. The SLA and the SLAF were in action within hours, launching heavy attacks on Tamil positions in the northern Jaffna Peninsula. Major offensive was launched in the Eluthamadduval area, some 30km east of Jaffna. This was a historic city that was once the rebel capital, and which they repeatedly attempted to recapture. Advancing towards the Elephant Pass – then under LTTE-control – with support of SLAF fighter-bombers and artillery, the SLA troops repeatedly stumbled into new ambushes and mine-fields, or came under artillery attacks, suffering a loss of 22 killed and 180 injured within the first two days of fighting. The rebels simultaneously suffered a loss of 75 killed and 300 injured. How fierce the fighting in this period was shows the fact that alone on 22 April 22 SLA troops were injured by rebel mortar fire during a single engagement near Kilali. The army continued the advance towards the Elephant Pass nevertheless, approaching to less than eight kilometres of it. In the following night the SLAF fighter-bombers – the crews of which used NVGs – destroyed two buses carrying four LTTE-leaders. According to governmental reports, based on intercepted enemy radio transmissions, the Tamils suffered a loss of 110 killed by the time; however, the SLA also reported a loss of 87 own troops killed and 320 injured. Most of the injuries were suffered to mines, then the area through which the Army advanced was heavily mined and booby-trapped, slowing down army progress. The Tigers, on their side, had to notice the improved reconnaissance capabilities and increased firepower of the Sri Lankan military: for example, during a single encounter that occurred when the SLA troops made a push for the town of Palay, 33 guerrillas were killed. The ferocity of battles even increased. By 28 April the SLA reported a loss of 131 soldiers, and 600 injured: the Tamils disputed these figures, claiming that 300 soldiers have been killed and 1.200 wounded. The blood-bath continued on 29 April as well, then the LTTE launched a counteroffensive forcing the SLA to withdraw from Jaffna in the face of fierce artillery and mortar fire. The Sri Lankan government admitting to have lost 187 dead and 860 wounded during the advance on the Elephant Pass, while other military reports indicated that losses were actually higher – 217 killed and 1.600 wounded. The offensive finally turned into a disaster: over 300 SLA soldiers were killed and 2.000 injured: the commander of the operation was relieved from his post. As the fighting on the ground turned into a battle of attrition, both sides were doing their best to re-supply. In attempt to intercept as many boats carrying cargo for LTTE, the Sri Lankan Navy had stepped up its patrols and was successful in destroying four such vessels. The SLAF was also called in to attack three boats that escaped the naval forces, and the jets managed to destroy one of these as well. Nevertheless, in the end the government had to stop this offensive, then it was clear that at such rate of casualties and with a strong enemy attack in the back, the continuation of the operation made little sense. Consequently, the politicians attempted to negotiate again. After a promising start, however, a new Norwegian peace initiative bogged down over a rebel demand for the government to lift a ban on their organisation before talks begin: in the end, there followed another period of no war, no peace. On 7 June 2001 the Tamils fired a MANPAD against one of SLAF An-32s that was underway with 50 troops from Anuradhapura to Jaffna, while underway over Wilpatu, some 160km north of Colombo. The missile - apparently a FIM-92A Stinger - failed to reach its high-flying target, however. Amid increasing concerns that the LTTE was massing troops for an assault to recapture the Jaffna peninsula, on 30 June the SLAF launched a fresh, two-prong pre-emptive assault on Tamil Tiger positions in the area. Right from the start this offensive was supported by heavy air strikes against predetermined targets, mainly in Pooneryn and Nagarkovil, but also close to the Elephant Pass. The MiG-23s were now especially active, sometimes flying up to two missions a day. Exactly what happened during this operation remains unclear, however, then the reports about it were scarce and not very detailled: most likely, it was not especially successful. The most recent addition to SLAF was a number of highly modified Mi-35Ps and Mi-24Vs, all of which have not only got a completely new camouflage pattern, Israeli RWRs and EW-systems (supplied in early 2000), modern warning systems for defence against IR-homing MANPADs, and Western chaff&flare; dispensers - but also small FLIR-turrets, mounted on the left side of the fuselage, right behind the cabin-doors. These "Hinds" appear to be a far cry from worn-out examples originally purchased from the Ukraine in the mid-1990s, which suffered a number of combat losses. They do not wear any national markings, and their camouflage patterns differs from helicopter to helicopter. The No.7 Helicopter Squadron SLAF operates a mix of at least six such Mi-24s and Mi-35s. Despite ongoing negotiations, when the new Sri Lankan President, Chandrika Bandaranaike Kumaratunga was away in London on a private visit, on 10 July 2001 the Prime Minister Ratnasiri Wickramsinghe ordered the SLAF into a string of attacks on LTTE bases in the Wanni area, causing heavy damage and losses. The government subsequently explained, that the attacks were undertaken in order to pre-empt a rebel offensive against Jaffna. Interestingly, in the Sri Lankan public it soon became known that the information about this possible offensive came from the Special Branch, an intelligence agency under the Inspector General of Police. The Directorate of Internal Intelligence (main intelligence arm) and the Directorate of Military Intelligence did not report anything similar, but only that the LTTE was busy re-training its forces and building stockpiles of supplies. Without surprise, the air strikes therefore resulted in an angry reaction from the rebels, who warned that the Sri Lankan government is going to bear the full responsibility for consequences... The “consequences” were to be delivered directly to the address of the SLAF. At the time it was obvious that the LTTE was not able to mount any major offensive against the Sri Lankan armed forces, partially due to manpower shortage and partialy due to depletion of its anti-aircraft ammunition and missiles. Several countries also tightened their security measures to prevent LTTE gun-runing and the closer surveillance of ships owned by Tamils by Western narcotics control agencies have created difficulties for Tigers to replenish their stocks. Suffering heavily from SLAF air strikes, the LTTE had only one alternative: attempt to neutralize the enemy aircraft on the ground. The tactics was nothing new for the Tamils, then they have undertaken such attacks against different other bases of the SLAF and the Sri Lankan Navy before. In the early hours of 24 July 2001, despite the fact that there are 90 sentry points around the complex, and over 500 men guarding it, some LTTE fighters, wearing SLA uniforms and carrying shoulder-launched anti-tank weapons, mortars, T-56 rifles and rocket-propelled guns (RPGs), managed to enter it. Their attack began at 04:00hrs local time with destruction of a power transformer, which plunged the airfield into darkness. Dressed in army uniforms, the insurgents then infiltrated via two different points after breaking through fences separating the civilian side of the airport. Here they began firing at military aircraft on a parking apron, using RPGs and small-arms fire. As several aircraft were fuelled, they bust into flames, lightning up the darkness and igniting additional fires. Within minutes, eight aircraft were attacked: three Kfir C.2s, two K-8s, one MiG-27M, one Mi-24V, two Mi-17s, and one Bell 412 were completely destroyed; one MiG-27M was badly damaged. Meeting with little resistance at the airbase, the infiltrators moved next to the international airport located across the tarmac, and as panic-stricken passengers and airport staff scrambled for safety, reduced two commercial planes belonging to Sri Lankan Airlines to ashes, and damaged several others. One, an Airbus A340, had a few hours earlier arrived from Singapore and was to leave for Milano at 5.30 a.m, but was destroyed. Another Airbus, an A330, was to leave for Chennai at 7.30 a.m but was destroyed as well. A third Airbus, an A330, had ist undercarriage badly damaged, while two A.320s were lightly damaged. Together, they constituted half the fleet of the national carrier. The security forces, including a unit of crack Special Forces commandos, then finally arrived to fight back, and the terminal of the airfield as well as nearby roads became a scene of a fierce battle that was about to last by the noon. As they were pulling back a group of rebels ended inside the airport terminal. One of them became trapped in the arrivals and departure lounges, finally deciding to detonate his so-called “suicide jacket”. In another encounter, troops and tanks rushed in from Colombo cornered a group of four rebels, who then detonated their suicide jackets, blowing themselves to pieces. In the third clash army commandos corralled another group at the arrivals and departure lounges, where another rebel blew himself up once cornered. One commando was killed by friendly fire; another died in the heavy gunfire exchanged with the rebels, while seven civilians were injured in the cross-fire. In total, 12 LTTE fighters were killed, including two suicide bombers. Also killed were six SLA troops, including three airmen and two commandos, while a SLAF technicians who was wounded succumbed to his injuries in hospital later. Six other airmen, a Russian technician working for SriLankan Airlines, and a journalist of the state-run television Rupavahini, who was the only such professional to be allowed access into the airport as the battle was going on, were also wounded in the cross-fire. The SLA troops captured three general-purpose machine guns, one 40mm grenade launcher, three RPG launchers, nine Type 56 assault rifles, eight explosive chargers and six shoulder-fired light anti-tank weapons. The total estimated cost of the destroyed aircraft was about $450 million, of which the Airbuses alone cost over $300 million. Barely an hour after the troops cleared and secured the runway today, Kfir and MiG jets took off to bomb rebel positions in the northern Wanni region – and the strikes continued in the following days as well. In fact, the ferocity of SLAF attacks on LTTE even increased by August, until a MiG-27M crashed during a low-level sortie. Nevertheless, the war after the LTTE strike against Katunayake airfield was never the same like before. Realizing that neither could win, both sides finally agreed to seriously negotiate. After much pushing from the Norwegians, finally, in February 2002 the LTTE and the government signed a ceasefire. Although repeatedly appearing to be disolving, this is still holding until today. Time and again, both sides are accusing each other of not acting accordingly; the LTTE also wanted to draft an independent Tamil administration, while the government of hard-liner Primer Minister Ranil Wickramsinghe is only ready to grant financial autonomy. - 27 May 1984: Bell 212 "CH-556" written off under unknown circumstances. - 20 November 1984: Bell 212 "CH-555" written off under unknown circumstances. - ?? ?? 1985: Bell 206 shot down during fighting with Tamils near Jaffna. - 11 October 1986: Bell 212 "CH-544" written off under unknown circumstances. - 3 June 1988: Bell 212 "CH-545" written off under unknown circumstances. - 5 May 1990: Bell 212 "CH-543" written off under unknown circumstances. - 13 September 1990: SF.260TP "CT-121" shot down near Palay by LTTE small arms fire, pilot KIA. - 5 July 1992: Y-8 "CR-872" shot down by LTTE SA-7 near Iyakatchitchy, during landing in Palay, killing all 20 on board. - 13 October 1993: IA.58A Pucara CA-601 crashed near Jaffna, wreckage towed away by SLA. - 2 August 1994: Bell 212 "CH-?" shot down during fire-fight with LTTE, closer circumstances unknown. - 29 April 1995: HS.748 Srs.2A “CR-835” shot down by LTTE SA-7 during landing in Palay, killing 52. - 29 April 1995: HS.748 Srs.2A "CR-834" shot down by LTTE SA-7 during take off from Palay, killing 43. - 1 June 1995: Cessna 421C "CC-660", damaged in wheels up landing, repaired. - 14 July 1995: IA.58A Pucara “CA-601” shot down by SA-7; pilot Flt.Lt. Pereira KIA. - 13 September 1995: An-32 “CR-861” crashed into the sea near Negombo; 75 KIA. - 18 November 1995: Y-8M “CR-871” damaged by 20mm Oerlikon guns while landing in Palay, four crewmembers killed and five injured as the plane overshot and crashed into the sea behind the runway. - 22 November 1995: An-32 “CR-862” (purchased from the Ukraine) shot down during landing in Palaly, killing all 63 troops and crewmembers on board. - 22 January 1996: Mi-17 crashed into sea near Vettilakerny, SAR operation produced no results; 39 missing. - ?? March 1996: Kfir C.2 crashed, reasons unknown. - 07 December 1996: Bell 212 "CH-546" that took off from Jaffna carrying a number of generals landed on territory controlled by LTTE due to technical problems; crew and passengers were evacuated by another helicopter, while the aircraft was destroyed by Sri Lankan Army on the ground. - 16 January 1997: IAI Super Scout UAV crashed into the sea? - 20 January 1997: Y-12 "CR-851" underway at 5.000ft when a memeber of the crew reported to Palaly ATC that an unknown vessel was spotted and the crew was about to descend in order to take a closer look; contact subsequently lost. Massive SAR operation produced no results; crew, consisting of Flt.Lt. Sudarashan Nanayakkara, Flt.Off. Prasanna Wettasinghe, Ld.Aircraftsman Wickremansinghe and Navy Lt. S. Ranaweera is missing. - 21 January 1997: Kfir C.2 "CF-712" crashed into the ground in the Negombo Laguna due to technical difficulties, pilot recovered. - 24 January 1997: SLAF helicopter, unknown type, damaged by small arms fire, but landed safely. - 21 February 1997: An-32 "CR-865" crashed at Ratmalana following aborted take-off; 3 or 4 KIA, 45 injured and 10 OK.
- 2 March 1997: two SLAF Mi-17s collided near Anuradhapura with unknown results. - 6 March 1997: Y-12 "CR-856" destroyed on the ground at China Bay AB, by mortar fire; 1 KIA and 7 injured. - 15 March 1997: IA.58A Pucara "CA-604" crashed after bomb exploded immediately upon release, in Kaudala area, the plane entered spin and pilot ejected to be recovered later. - 19 March 1996: Mi-24 "CH-614" shot down by LTTE SA-7 into the Bay of Bengal, near Mullaitivu, killing eight (including a Russian pilot and flight technician). - 21 April 1997: An-32 "CR-860" crash-landed but subsequently repaired. - 14 June 1997: SF.260 crashed during training flight near Talawa; instructor KIA, pilot OK.
- 12 September 1997: Mi-24's tail rotor hit by ground fire, helicopter made emergency landing and was later repaired. - 10 November 1997: Mi-24 "CH-619" shot down by FIM-92A, two KIA and two recovered. - 10 November 1997: Mi-17 damaged by the same missile that shot down the Mi-24, crash-landed, without injuries to crew. - 25 November 1997: Bell 212 "CH-561" crashed near Puliyankulam during MEDEVAC mission, crew of four killed. - 7 January 1998: Mi-17 "CH-594" damaged beyond repair by RPG- and mortar hits while attempting to evacuate 20 injured soldiers; 2 heavy- and 5 slightly injured. - 26 June 1998: Mi-24 "CH-620" shot down south of Vavunia, killing four, including Fl.Off. Kodithuwakku, Pil.Off. Aathique, IAirm. Witharana and I.Airm. Pereza. LTTE claimed the helicopter to have been shot down, but SLAF sources credited the loss to technical problems. - 28 March 1999: IAI Super Scout UAV, destroyed by rebels after crashing; reportedly the last operational UAV with SLAF at the time. - 17 December 1999: Mi-24 shot down near Parantan, crashing into Jaffna Lagoon; four crewmembers KIA. - 18 February 2000: Bell 412 on MEDEVAC sortie claimed shot down by LTTE over the Thenmaradchi Division of the Jaffna Peninsula. Fate of the helicopter unclear; two SLAF crewmembers (co-pilot and gunner) were killed, four Army casualties on board, pilot, and another crewmember were recovered. - 24 May 2000: Mi-24 shot down by MANPAD over the part of Jaffna Peninsula held by SLA; both gunners were killed, but pilot and co-pilot survived the emergency crash-landing and were recovered. - 30 March 2000: An-32 “UR-79170” (leased from the Ukraine) shot down by MANPAD near Vavunya; crew of four Ukrainians and 36 injured soldiers on board were all killed. - 24 July 2000: FT-5 crashed during training flight; fate of the crew unknown. - 15 September 2000: Mi-17 crashed in the eastern region of Sri Lanka, killing all on board including a minister in SL government. - 19 October 2000: Mi-24 shot down near Nagar Covil by AAA, probably ZSU-23-4; reportedly crashed in an area held by SL security forces and was destroyed on impact. - 23 October 2000: Mi-24 shot down by LTTE MANPAD while supporting pursuit of LTTE raiders on Trincomale harbour; crew of four KIA; wreckage was recovered and the helicopter probably returned to service. - 24 July 2001: Kfir C.2 “CF-722”, destroyed at Katunayake AB by LTTE sappers. - 24 July 2001: Kfir C.2 “CF-723”, destroyed at Katunayake AB by LTTE sappers. - 24 July 2001: Kfir C.2 (reported) destroyed at Katunayake AB by LTTE sappers. - 24 July 2001: K-8 “CF-741”, destroyed at Katunayake AB by LTTE sappers. - 24 July 2001: K-8 “CF-743”, destroyed at Katunayake AB by LTTE sappers. - 24 July 2001: K-8 “CF-745”, destroyed at Katunayake AB by LTTE sappers. - 24 July 2001: MiG-27M “CF-732”, destroyed at Katunayake AB by LTTE sappers. - 24 July 2001: MiG-27M badly damaged at Katunayake AB by LTTE sappers. - 24 July 2001: Mi-24 destroyed at Katunayake AB by LTTE sappers. - 24 July 2001: Mi-17 “CH-590”, destroyed at Katunayake AB by LTTE sappers. - 24 July 2001: Mi-17 “CH-597”, destroyed at Katunayake AB by LTTE sappers. - 24 July 2001: Bell 412 destroyed at Katunayake AB by LTTE sappers. - 15 August 2002: Y-8 “CR-873”, crashed during non-combat related mission. - 22 October 2002: Kfir C.2 crashed during non-combat related mission. - 09 June 2004: MiG-27M crashed during non-combat related mission. - Different articles in AirForces Monthly, AirInternational and Combat Aircraft magazines, as well as related press-reports from news agencies including Reuters, CNN, BBC etc.